Maybe this does not look miraculous to you. But to me, it does: a printout of a recipe (for Jacques Pépin’s Curry Coleslaw) coming out of our printer, on the second floor and in the study of the Manse. Having been told to do so by me, hitting a button on my phone – my phone! – on the first floor of the Manse. No wires or strings attached. Life is in so many ways a lot easier now than it was when I was growing up in this house… And if you’re intrigued by the vintage Birks box that you can see on top of the printer, stay tuned: it’s a good story, and another post. This has been a truly gorgeous winter day, has it not? The sun shone and there was not a cloud in the sky. There was real warmth in the sun. 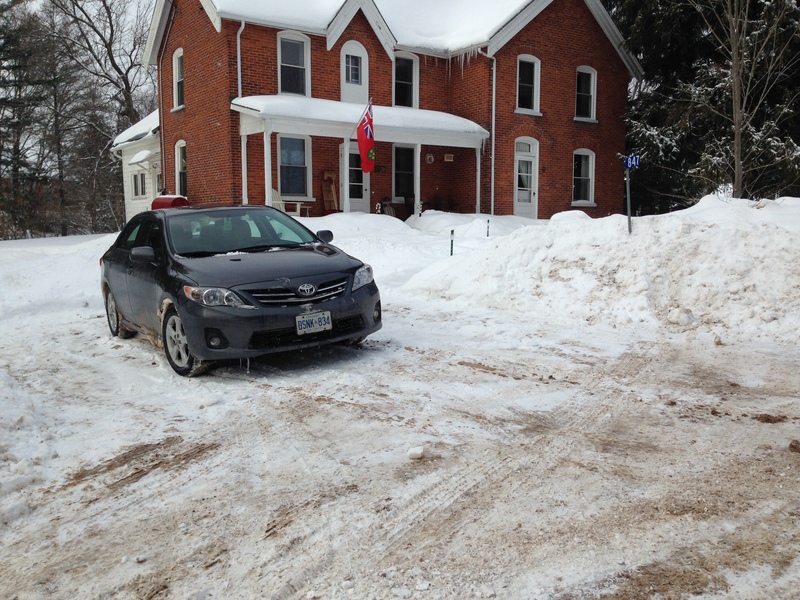 As a result, everybody whom Raymond and I met on our errands in Madoc and Tweed today was in a good mood. The car washes in both towns had major lineups of winter-crusted Ford F150s (the pickup truck of choice in our area) lined up to get de-salted and de-grimed. It felt like maple-syrup season must be almost upon us. I think, people, that the back of this cruel, cold winter really has been broken – just as I predicted a few days ago. Life is good. The recipe I wanted – Curry Coleslaw – found on my phone, in milliseconds. Miraculous! This morning I was sitting in a comfortable rocking chair in the sunny dining room of the Manse, putting together a shopping and to-do list for the aforementioned errands. Since this is the first weekend in quite a while that Raymond and I have not been out of town or hopelessly busy, I decided it would be a good time to do some serious cooking. And so – on my phone – I consulted the excellent New York Times section called Cooking (and you can too if you click here). I pulled up the recipe for Roast Pork With Milk, which I’d seen in an email alert from the Cooking folks this past week and thought would be worth a shot. (It was. Delicious.) Raymond suggested that tomorrow night he make fried chicken, another recipe from NYT Cooking. Great idea! (Because it was fantastic the first time he made it.) And then I got thinking: what goes well with fried chicken? Aha! Coleslaw. Except store-bought coleslaw is inevitably an oversweet disappointment; in fact, I tend to find coleslaw in general a disappointment. I needed a good and interesting coleslaw recipe! Okay, back to NYT Cooking, on my phone. 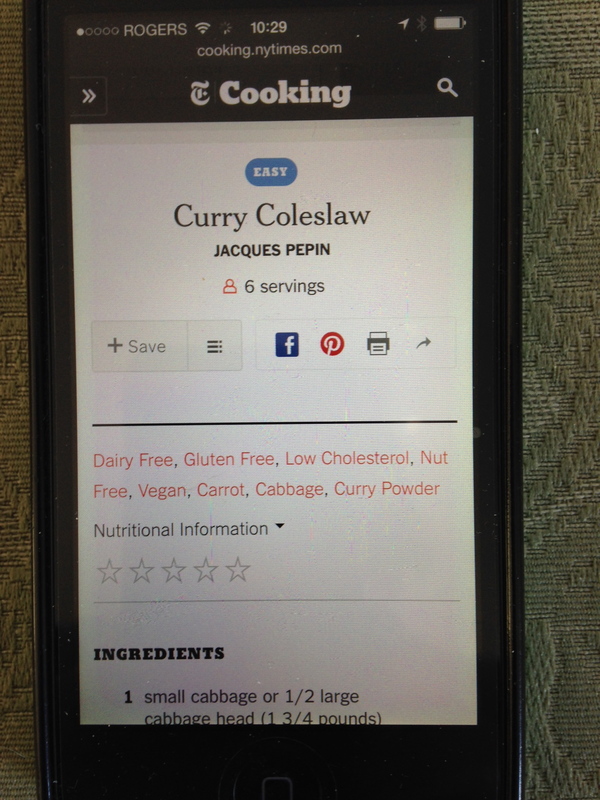 Search “colelsaw.” Find the ever-reliable Jacques Pépin‘s recipe for Curry Coleslaw, with a hit of tabasco, poppyseeds and curry powder to give it some zip. Sold! I hit the Print icon on the recipe on my phone. 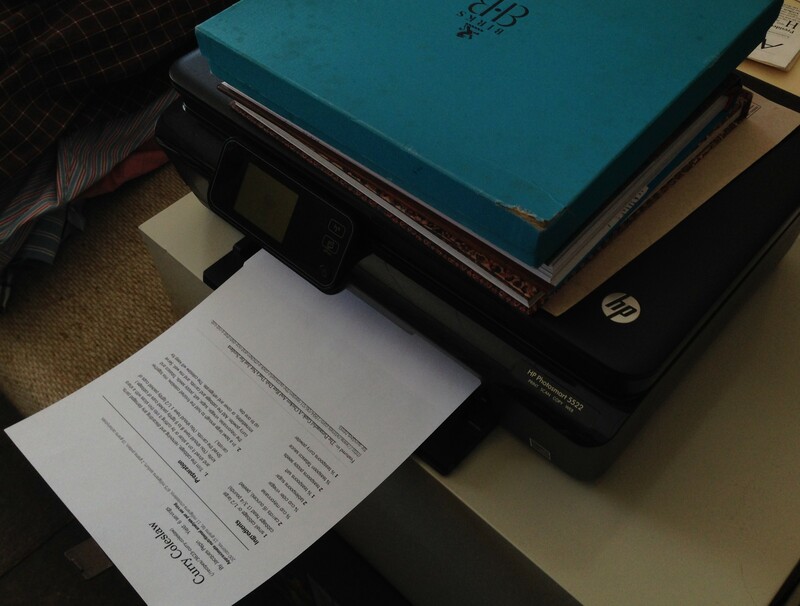 Thanks to the wifi in the house, the phone instantly located the printer upstairs in the study. And before I had time to get upstairs and fetch the printout, it was, well, printed out. And by wonders, I mean: using a phone to look up recipes. On the internet. The internet! Do you remember life before the internet? Well, today, I did. That life involved finding recipes only in the cookbooks (like the Queensboro Cook Book), or the recipe cards in your recipe box, that you happened to have around your house. The phone only played a part in it if you happened to pick up the heavy old receiver and call a neighbour for some cooking guidance. And then there was this: having in seconds located a great recipe from a famous chef and food writer on my phone; hitting a print button and having that recipe magically turn into a printed piece of paper, emerging from a printer that is in the Manse study, one storey and several rooms away from where I was sitting – with no wires attached! If anyone had told me on, say, Feb. 28, 1975, exactly 40 years ago today, that someday I would be able to do that – well, it makes me laugh to think how I would have reacted. The phrase “bug-eyed” comes to mind. People, we live in an age of miracles. Miracles that are so common and ordinary that most days we just take them for granted. I was happy that today – thanks perhaps to the unlikely fact that I am living in the house I grew up in, and can thus readily compare how things were then and how things are now – the sheer miraculousness of the changes that have occurred in the time in between was forced into my consciousness. We should never forget how lucky we are that some of the basic tasks of life – like finding a desired recipe, or a video of a long-lost favourite song – are so effortless. Compare that to what the people who lived right here where we are now had to deal with, if they might have thought to try to seek out the same information. And on that note, here’s a great Talking Heads song that’s been bombing around in my head all day, ever since that moment when it struck me how miraculous this helpful technology is. It’s less about miracles and more about being respectful of what happened before us on the very land where we stand and live, but because it’s called City of Dreams – which is kind of like “age of miracles” – it seems appropriate for the moment. Enjoy! Ah, Friday night. Best night of the week! Regular readers will know that I often devote Fridays to musically themed posts, because I figure that both you good people and I need a diversion that doesn’t require too much brain power, or reading, at the end of a long work week. On Friday night, it’s nice to just sit back and relax and listen to some music. On this particular Friday night, I’d like to feature a friend of us all (that last bit being a turn of phrase that George Harrison used to introduce Bob Dylan at the Concert for Bangladesh; thanks, George): Mr. Ringo Starr. And thinking about Photograph, and what a simple but great pop classic it was, and is, got me also thinking about some of Ringo’s other post-Beatles hits, which also coincided with the years when I was a kid here in this house that, through a happy chain of circumstances, I now live in once again with my wonderful husband, Raymond. I saw this picture on Facebook the other day, and while I’m not much for those “LIKE if you remember this!” Facebook things, it really did bring back a bucketload – or should I say an armload? – of happy memories. I hope it does for you too. Do kids still play Red Rover in the schoolyard, do you suppose? Even though I was absolutely terrible at the game – I was small for my age, and hardly ever able to break through the clasped arms of the opposing team, or to keep members of the opposing team from breaking through my arm clasped with someone else’s – I always thought it was fun. Because I was so terrible at breaking through the barricade of arms, I got “called over” a lot – as “Kathy,” which is what people called me way back then. I didn’t mind the calling over. I always tried hard, and sometimes I actually did break through, which was thrilling; you’d trot back to your own team feeling very chuffed. And if I didn’t succeed (which was most of the time), I cheerfully joined the other team. 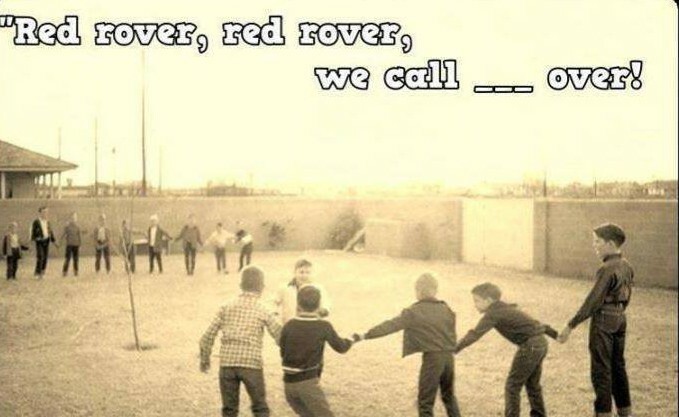 Seeing the photo on Facebook reminded me not just of Red Rover, but of the other games we used to play in our gorgeously expansive playground (several farm fields’ worth) at what everyone referred to as “the Township School.” It reminded me of Field Day back in the mid-’60s, before Field Day got overly organized and turned into Track and Field Day with hurdles and the high jump and the standing long jump and the hundred-yard dash and whatnot. On those earlier, less-structured Field Days – when (as you can imagine, based on the name of the event) the whole school abandoned classrooms and headed out to the playground/fields – we had events like the three-legged race (in which your right ankle was tied to your partner’s left ankle by one of your dad’s ties that you had to bring to school for the occasion) and the potato-sack race, in which you had to hop to the finish line in a burlap bag originally used for potatoes. Hey, did we have to supply our own potato sack, along with one of our dad’s ties? I can’t remember. What I do remember – of the three-legged race, and the potato-sack race, and Field Day, and especially Red Rover – is lots of awkwardness and hilarity, zero time spent in front of screens, and good old-fashioned fun. The place: the Manse’s front yard. The time: winter (obviously) 1971 or ’72. The hockey players: (from left) Larry Parks of the Boston Bruins, John Sedgwick of the Montreal Canadiens, and Ken Sedgwick of no fixed team and, like a real hockey player, missing a few front teeth. People, I am no weather forecaster, but I’m going to venture this: I think we may have finally broken the back of this brutal winter. Yes, I know the windchill is supposed to be down at some ridiculous double-digit-below-zero number – again – overnight tonight; but have you noticed how in the daytime for the past couple of days, the air has felt a tad less bitter? That there has seemed to be a tiny bit of warmth in the sun when it shines? And that the sun has, in fact, been shining a fair bit recently? I do believe we will come out of this thing yet. And that there will be spring, and that the bulbs I planted late last fall on the south lawn of the Manse will come up. Isn’t it a great photo? Don’t you love the low-tech hockey uniforms and equipment, the less-than-fancy skates, the missing front teeth in Ken’s big smile, and the chipped, uneven ice under those skates? Does it bring back memories of the days when a makeshift rink in the front yard was all kids needed for endless hours of fun? The photo (which comes to me courtesy of grown-up John) does all that for me, and in addition provides still more useful evidence of how our corner of Queensborough looked back then – which I’m guessing would be about 1971 or ’72. Maybe you won’t be surprised to hear that this corner of Queensborough doesn’t look very much different even now, 40-some years later. 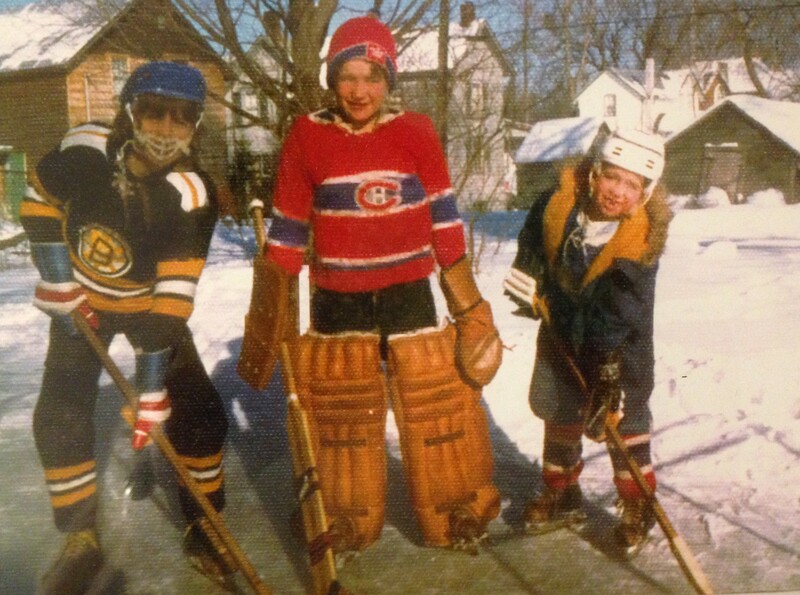 Which cheers me almost as much as does this delightful photo of three boys having fun on our front-yard rink, in simpler times. Good old times. “A Netflix Original Series:” that translates into “Forget about it” if you’re a fan who lives in Queensborough and wants to watch it along with the rest of the world on the internet. 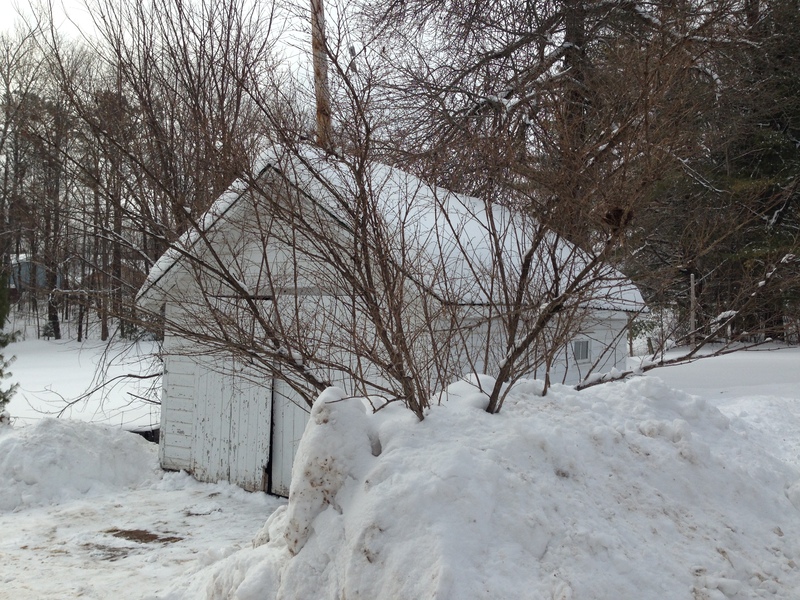 Last night in this space I was waxing on about one of the simple joys of living in an old house in the country, to wit shovelling snow to a soundtrack of chickadee song. But there are definitely some downsides to old-house rural living too. Tonight, for instance, I returned wearily home from work, only to discover after turning on the lights, turning up the heat (Raymond was out) and petting the yowling cat that the hot-water pipe to our kitchen sink had frozen. Again. And did I mention that Raymond was away? The past two or three times that the same thing has happened, he has done what all good husbands do, which is deal with it. Tonight, I was on my own. Happily I was able to manage without too much trouble, with a small bit of instruction over the phone from Raymond and my trusty hairdryer turned to high. Crisis over. Anyway, Raymond and I have enjoyed Seasons 1 and 2 of House of Cards, but not on Netflix. Oh no. Netflix, you see, comes through that crazy modern invention called the “internet.” If you live in a town or city, chances are excellent that you can use all the internet you want at a very reasonable monthly fee – maybe somewhere between $35 and $50. 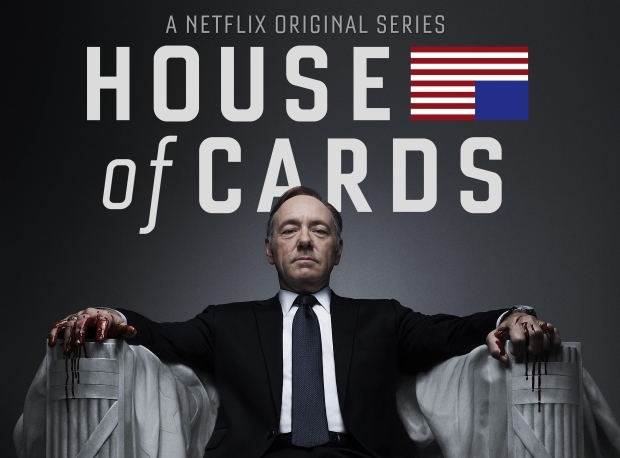 And as of this weekend, you can gorge on Season 3 of House of Cards. But if you happen live in some rural pockets of Eastern Ontario, like, say, Queensborough, there’s no House of Cards when the rest of the world watches it. We must wait patiently for the old-fashioned DVDs. Here, you see, we have a choice between not-too-expensive but not-very-good (dial-up is not uncommon, believe it or not) internet, or, if you’re Raymond and Katherine, a wireless hub that delivers not-zippy but not-bad internet, at a ridiculously high price. I wrote here about our first case of sticker shock after making the rookie mistake of doing what all city folk do and listening to some online audio. There have been a few more sticker-shock bills since, including this month’s because Raymond had the temerity to use the internet extensively for the work he’s doing as editorial consultant to the National Newspaper Awards. Imagine: thinking you could actually use the internet for work! Oh, now I’ve gone and got myself all riled up. I must try to calm my nerves with the hope that there is light at the end of this tunnel, just as there was hot water coming out of my tap tonight after a bit of water-pipe blow-drying. That glimmer of light is the new internet tower that has been erected just northeast of Queensborough, and that I believe is to come into service this spring. An awful lot of people in our little village are pinning their hopes for reliable and reasonably speedy internet, at an affordable price, on that tower. As are Raymond and I, of course. Fingers crossed that it delivers on our hopes – and maybe in time for Season 4 of whatever brilliant skulduggery Frank and Claire can get up to. 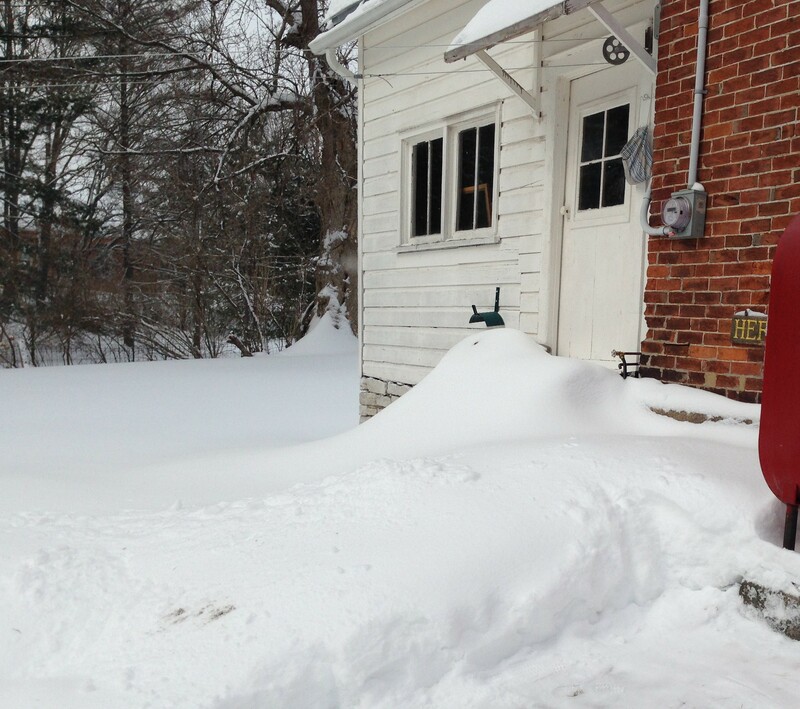 It’s a pretty snowy and wintry view from the front porch of the Manse these days. 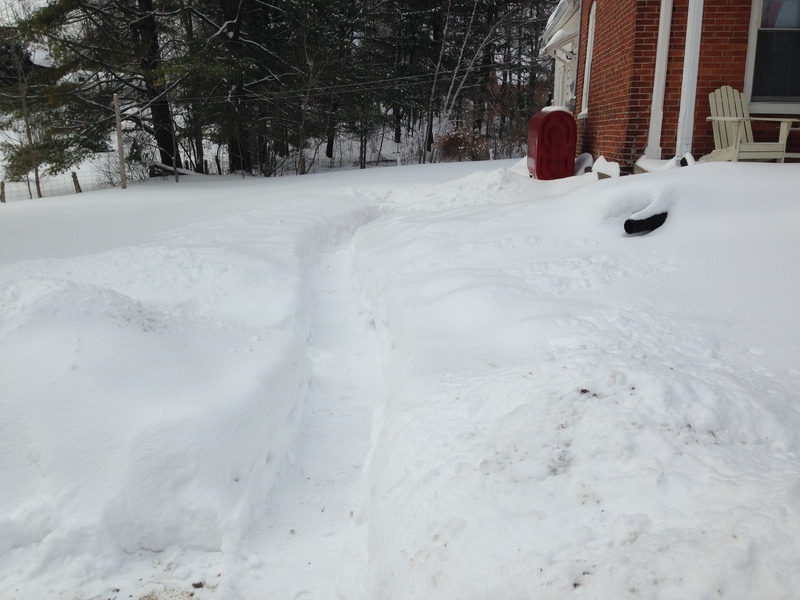 And that can only mean one thing: lots of shovelling. Do you have a chore that you find relaxing rather than a pain in the neck? I know a few people for whom ironing serves that purpose; they enjoy the quiet reflection time that standing by the ironing board gives them, not to mention the sense of satisfaction that a well-ironed shirt gives. I know others who seem genuinely not to mind, and indeed even enjoy, doing dishes by hand. 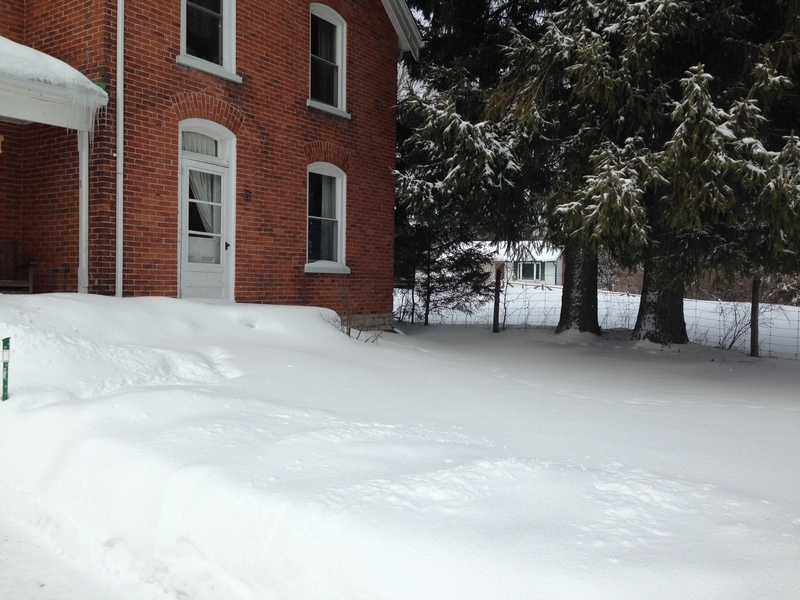 I’m not one of those happy ironers or dishwashers, but since Raymond and I moved full-time to the Manse, I have found a task that I really do enjoy: shovelling snow. Shovelling can of course be hard work, especially when the snow is heavy and there’s lots of it. Sometimes my back hurts a bit after a long session, but less and less often now that I’m doing it regularly; I have to say that the exercise feels pretty good. But even better than the exercise is the satisfaction of making a clear way where minutes before there was nothing but many inches of snow. 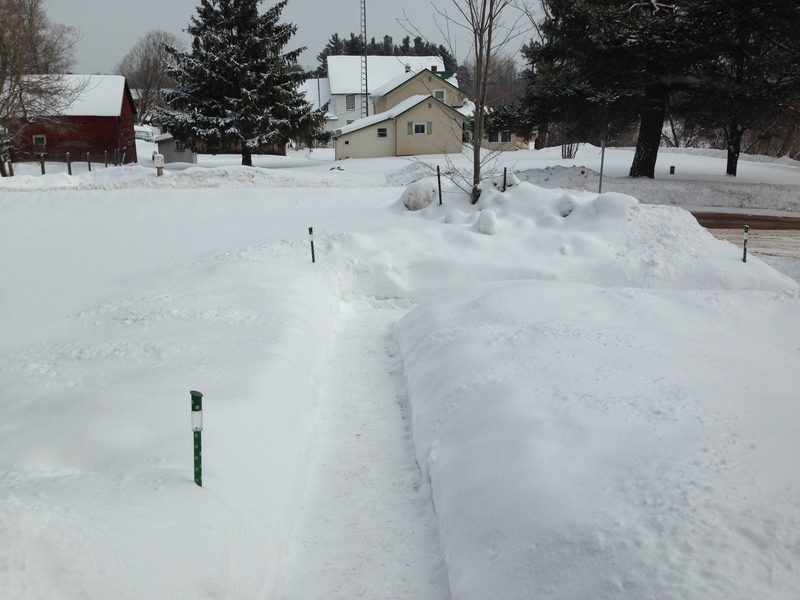 And best of all is the soundtrack I generally have while I’m shovelling. I’ll get to that in a minute. People, I do like to shovel. But even I have a limit. Okay, now for the soundtrack. It was pretty quiet in Queensborough when I was doing all that shovelling yesterday morning. But then, it’s pretty quiet in Queensborough almost all the time. 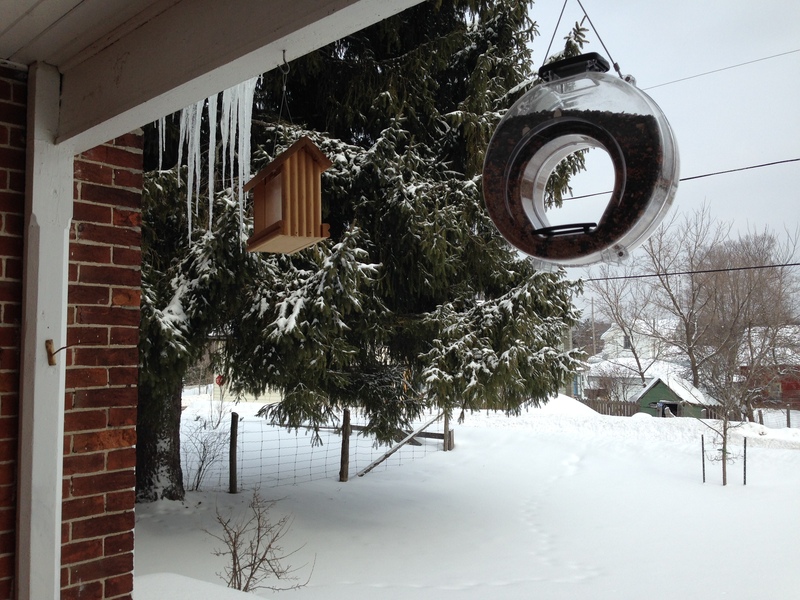 The only thing I could hear was some boisterous chickadees who were chick-a-dee-dee-deeing all the while. What a lovely sound! I wondered if they were commenting among themselves on the quality of my work. Now, isn’t that a good kind of soundtrack to work by? It made me happy as I headed back indoors, my shovelling done. Or, well – maybe not. Because right then, it started to snow again. 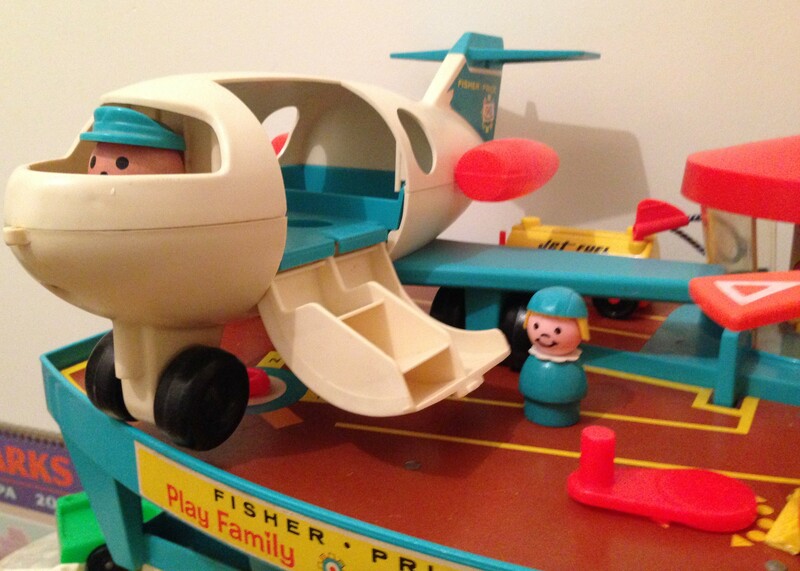 The most recent addition to our collection of vintage Fisher-Price toys: the Play Family Airport. On a wintry day like this, don’t you wish you could be a little Fisher-Price person and jump into that Fisher-Price plane and fly away south? 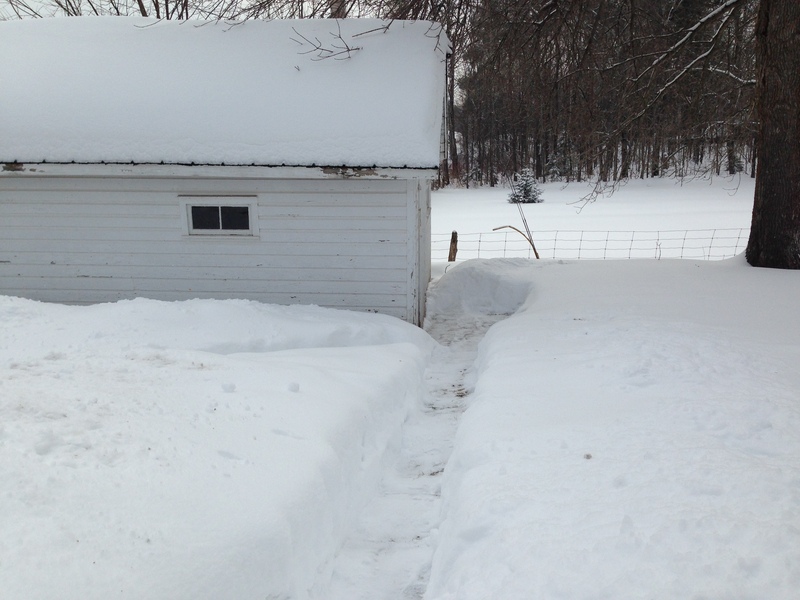 I don’t know about you folks, but I am really, really tired of this winter. As I write this, it is snowing outside the Manse windows. Again. Meanwhile, I heard yesterday that we are on track for this being the coldest February ever. Yikes! People’s nerves are stretched by all this cold and snow, I tell you. At least, mine are. I bet yours are too – unless you happen to be reading this in some sunny southern getaway. Ah, but speaking of sunny southern getaways, doesn’t weather like this make you long to get on a plane and go somewhere nice? Somewhere different? Preferably somewhere warm? Well, have I got the thing for that! Yes, it’s the Fisher-Price Play Family Airport! All right, you can’t actually jet off from the Play Family Airport. But you can be a kid again, and dream. The schoolmarm waits for her pupils at our Fisher-Price School. The airport is my latest addition to a small collection of great Fisher-Price toys from back in the 1960s and ’70s – not coincidentally, the years when I was a little kid growing up here at the Manse and playing with such toys with my sister and brothers. 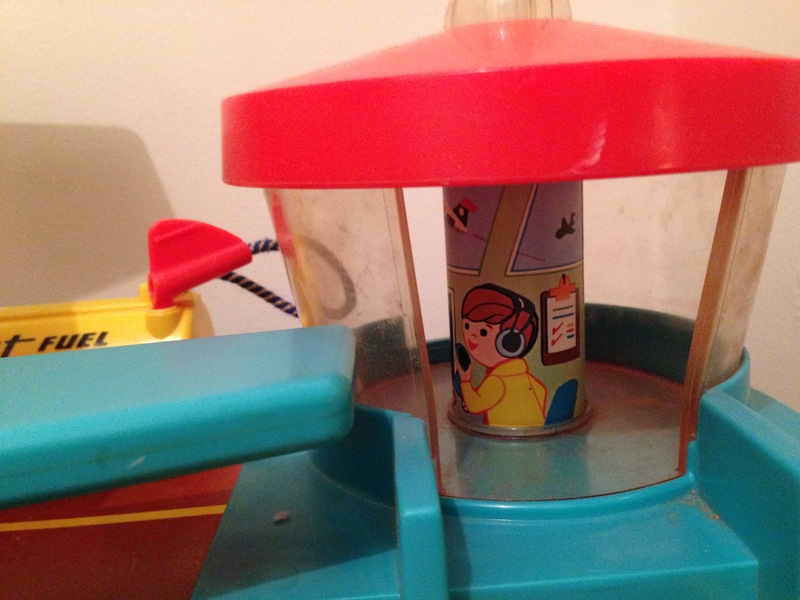 Those were the days when, in my opinion, Fisher-Price stuff was more elegantly designed than it is now. It was more compact and less plasticky and princessy. 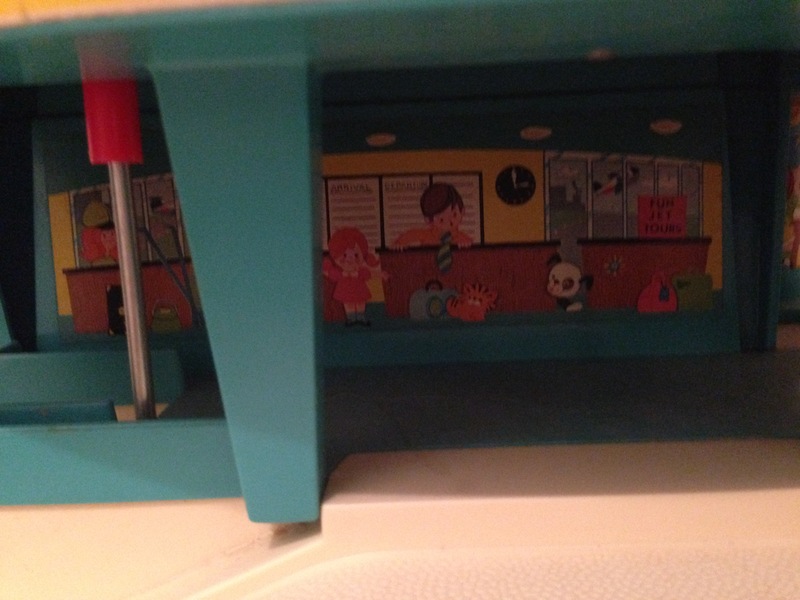 I wrote some time ago (that post is here) about my delight in acquiring a Fisher-Price Garage, which as I recall pretty much every household had back in the days of my Queensborough childhood and was truly the best toy ever. You could run your cars up and down the ramps, or move them in the elevator that dinged at every floor, or turn them around on the top-level car turner, or fill them up with gas at the bottom-level gas pump – and it was all just a whale of a time. Good for keeping kids quiet and occupied for hours. 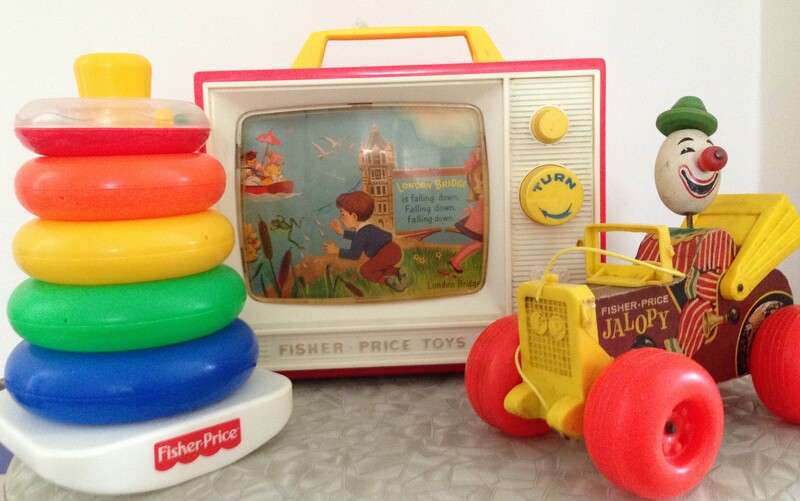 Our vintage Fisher-Price Two-Tune TV, Jalopy, and whatever that colourful ring thing is called. Anyway, I was pretty happy with this fun little collection, which needs only Raymond’s grandson Henry to come visit for some serious fun to be had. And the best part of it was that none of these Fisher-Price treasures had cost more than a few dollars; one or two of them I picked up at yard sales for less than a buck. Yay! But then last summer, when Raymond and I were vacationing down in Maine and taking part in one of our favourite vacationing-in-Maine activities, which is to visit antiques and collectibles warehouses, I came upon a Fisher-Price Play Family Airport for sale. Now this was a find – mainly because it was a piece of the Fisher-Price universe with which I was utterly unfamiliar. 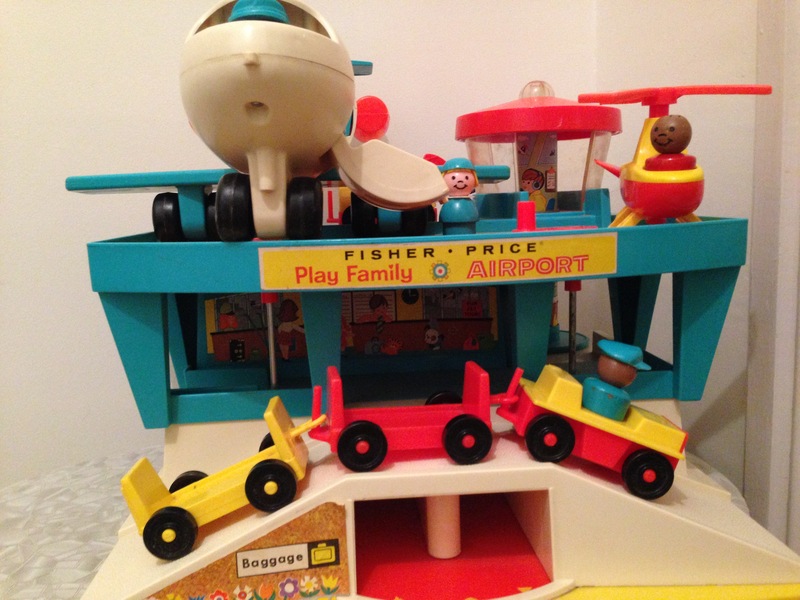 While everyone had the Fisher-Price Garage back in the day, and there were lots of Fisher-Price schoolhouses and barns and buses around, nobody that I knew had a Fisher-Price Airport. I’d never even heard of it, let alone seen it. So even though it was over my usual Fisher-Price price limit, I decided it would have to come to the Manse. 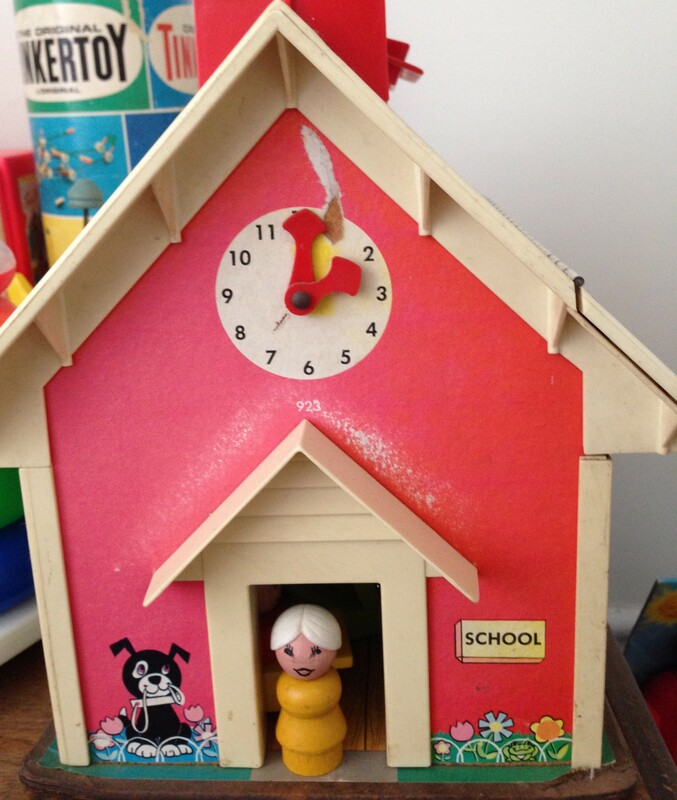 Because, you know, the only thing better than a vintage Fisher-Price toy is a relatively rare vintage Fisher-Price toy. I love our little Fisher-Price airport! Not that I spend much in the way of time with it; when I pulled it out the other evening to take the pictures that you can see here, it was the first time I’d really examined everything about it in detail – but it makes me smile when I see it tucked away in its spot in the Manse’s children’s corner.